I can count on one hand the books I've started reviewing before I'd even finished reading them. This is always because I can barely contain myself from sharing what I think. 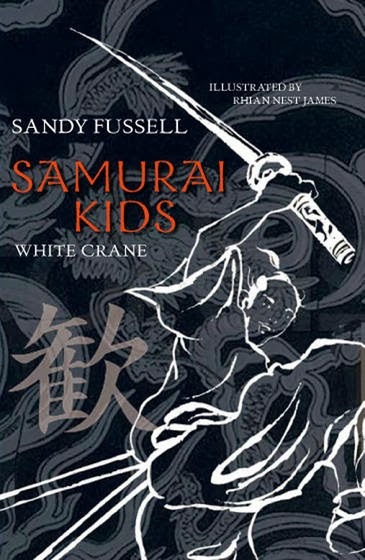 This, the first in the Samurai Kids series by Sandy Fussell - was one of them. I thought this book was absolutely superb. Even the greatest and most fabulous stories suffer from average prose, but not in this case. Fussell's writing is clear, evocative, funny and honestly quite beautiful - to the point where I frequently stopped, breathless in wonder at how a certain sentence or concept could appear so seamlessly and exquisitely in anyone's mind. Honestly? I did not expect to enjoy this book. I thought I might like it but, due to the fact that I'm not an eleven-year-old boy, I didn't at all expect to fall about helplessly over it. Well, maybe there's an eleven-year-old boy hiding in my psyche somewhere because I couldn't get enough of number one in this extraordinary series. I delayed my work schedule to read it. I planned my reading spots around it. I made the family wait for Sunday breakfast while I lolled in bed, hunkered under the covers with my head in another world. The Samurai Kids series tells the tale of a bunch of misfit Samurai trainees from the Cockroach Ryu - misfit in that they have struggled to fit into ordinary society. There is Yoshi - a large and strong but inverted boy who doesn't want to fight. He has the spirit of the tiger. Then there's Mikko, a one-armed boy with the spirit of the striped gecko. Next there's Kyoko, a white haired-girl with pink eyes and six fingers and toes, with the spirit of the snow monkey. There's also Taji - a blind boy with the spirit of the golden bat, and Nezume, an outcast with the spirit of the long-tailed rat. Lastly, there is our narrator, Niya Moto - a wise, one-legged boy who houses the spirit of the white crane, and speaks so eloquently and with such wisdom, it will send shivers down your spine. But he is also 'just a kid' and the moments of roustabout boy-ness the author injects into this serenely penned character and his friends, lends a warmth, humour and reality to the story that hooks the reader instantly. All of these young warriors are nurtured by a great samurai warrior retiree - Sensai, or Ki-Yaga the wizard - an ancient and zenlike master whose love for these children is palpable, beautiful - and oftentimes hilarious. In book one, Sensai's kids are training to compete in the Samurai Trainee Games. But how can the kids of the Cockroach Ryu possibly compete with the likes of the strong, able-bodied trainees from the Dragon Ryu, under the tutelege of the infamous and powerful Dragon Master? But, as Sensei soon teaches his charges - all that glitters is not gold. Could this powerful, glittering Dragon Master really be just a bag of hot air? Fussell has created an incredibly likeable band of characters in this series. The characters are human, flawed (yes, even Sensei) and extraordinary, but it is the relationships, the camaraderie, the virtually unspoken bond between the warriors of the Cockroach Ryu that are the most mesmerising - and that typify the silent, all-knowingness of deep friendship that exists in Japanese culture. Essentially, there is no way you can finish book one without tumbling headlong into book two, desperate for more. The book is interspersed with illustrations by Rhian Nest James, whose work perfectly complements the story - both in terms of illustrative style and cultural detail, and in terms of gathering up the characters and presenting them so ideally, you cannot imagine these kids looking any other way. These are the type of illustrations I actually anticipated (there is only one full-page image per chapter) and subsequently devoured when they did arrive. The detail, the cultural and historical referencing, the way the story's words slip off the page and paint cherry blossom images in your mind, is absolutely priceless. Fussell's prose is as elegant, pure and vivid as the ways of the samurai. She writes in such a way that perfectly balances action, strength and drama with wisdom, clarity and evocative beauty, making this a series that all ages and genders will plummet headlong into. Your positive review really makes me want to read this book, Tania. I did expect it really, Sandy is a wonderful writer, for sure!